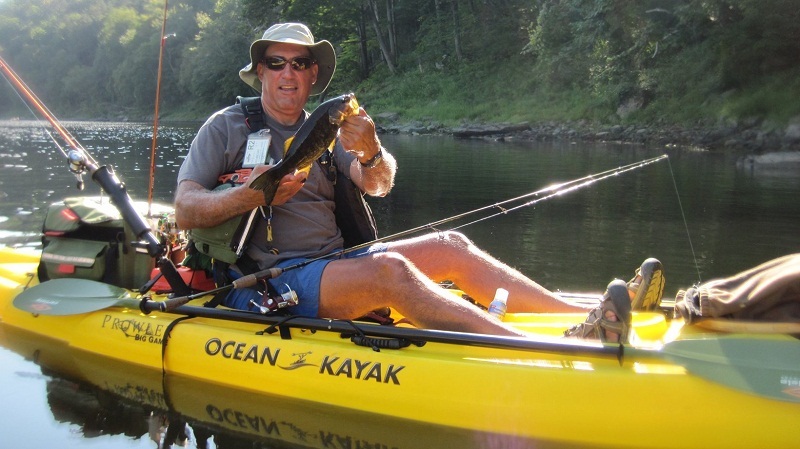 Fishing, kayaking, boating, and… hiking? Water shoes – protective, active, water footwear – are no longer the unsightly and impractical beasts that they once were. They’ve evolved into a form of utilitarian footwear, a combination of sneakers and sandals. Their popularity has soared, but with a plethora of options comes confusion. In this guide, we’ll help you avoid the confusion, walking you through exactly what a water shoe is, how to approach buying one, and the best water shoes for fishing, boating, and, yes, hiking. Foot Protection – We’re not talking about flip flops here. Slides have their place, too – the local pool or, say, a public shower – but water shoes are generally designed for more active pursuits. Ever walked on a sharp, rocky lake bed or floated through turbulent whitewater after falling out of your boat? Water shoes protect your feet from the spikes, bumps, and abrasions of the unfriendly underwater world, all while keeping the rocks and sediment out. Manufacturers – In search of a “one shoe to rule them all” type of thing, have blurred the line between water sports and land sports. It wouldn’t be a stretch to call them amphibious shoes rather than water shoes, because they’re good on land, on water, and in the air (you know, when you prop up your feet to lie back and take a nap). Depending on the model, they’re equally at home on an overnight river trip, on a rainy walk through the city, or on a sailboat destined for the sunset. Excellent Traction – Because water shoes are obviously meant to be used in water, companies recognize the high possibility of slippery footing and the importance of a grippy sole. In all the situations listed above, above-average traction will give you an advantage. Quick Drying – The purpose of water shoes is not to keep your feet dry. You can accomplish dry feet in a number of ways – sealed rubber boots, Gore-Tex socks, staying at home – but water shoes are a less expensive, more durable, and infinitely more fun option. Your feet get wet, so what? The important thing is that they don’t stay Water shoes shine in this regard. Ever Smelled Your Feet – after they’ve been sloshing around in a hiking boot all day? ‘Nuff said. Wait, isn’t that a benefit? Because water shoes are uniquely able to do the job in so many different situations, they’re not the best for specific situations. All of these shoes have great breathability, but on hot days when you don’t need the full-foot protection of a shoe, open sandals will be more breathable and, most likely, more comfortable. For cold weather when you know your feet will be wet, your water shoes won’t provide much insulation. And while water shoes can be decent on land, they won’t provide the protection or support you would want on a long, multi-day hike. Another pair of shoes. With an extra pair of shoes comes an added expense and another piece of gear to pack and clean. There are many factors that make a quality water shoe. Lesser quality shoes may have imperfect or irregular stitching and a flimsy feel. You may also feel rough edges on the inside, as cheaper manufacturers cut corners by leaving out pads to cushion hot spots. More important than getting the highest quality shoe is getting the right shoe for you and your activities. See below for what to prioritize in a shoe for kayaking, fishing, and hiking. 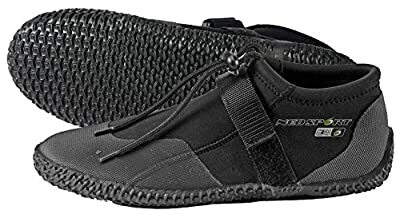 Kayaking – For whitewater kayaking, you’ll want a shoe that stays on in any situation and will provide the protection and traction you need for standing in rocky rivers. For flatwater kayaking or vacation fun, a comfortable, quick-drying shoe will do the trick. Fishing – If you will be sitting in a boat or standing on shore, your water shoes don’t need to have fancy, technical properties; wear what’s comfortable. Standing in a boat? Prioritize traction. Better shoes will utilize tackier rubber on aggressive soles – our reviews below tell you which shoes lack a tacky sole. Wading in a rocky river? Look for traction and foot protection, including a lacing system that won’t let the shoe slip off. A shoe with ample support, something you can tell from the rigidity and height of the upper, is also a good idea. 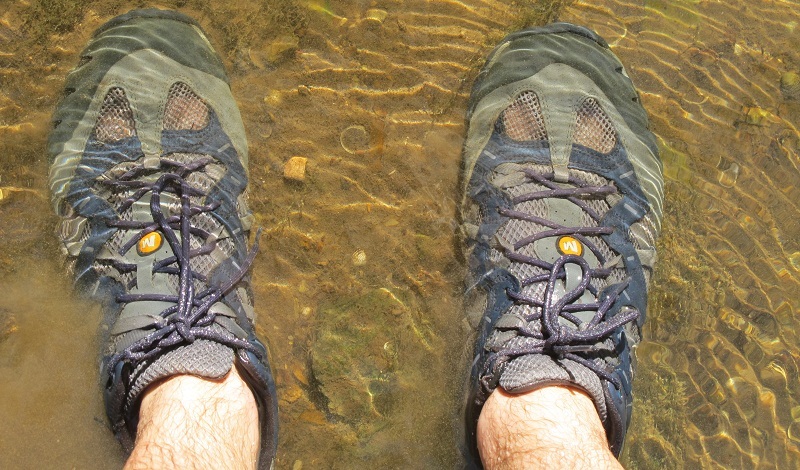 Hiking – Water shoes are a great choice for short hikes due to their quick drying properties and breathability. Look for a shoe that has a rugged sole and plenty of protection. If the shoe utilizes elastic in the heel, make sure it won’t stretch too loosely, or it won’t keep your foot in position on steep uphills. Regular laces, rather than an elastic pull tab or a slip-on shoe with no lacing, will provide support while on irregular terrain. Keep in mind that wet feet will be more prone to blisters, so a shoe that breathes well and fits your feet right off the bat, without needing to break it in, can save you hours of pain later. Once you’ve perused the list below and picked out the shoe that best fits your needs and activities, do your best to find it in a store and try it on. If you’re ordering online and aren’t sure of your size, find a site that has a lenient return policy and order one pair of your best size guesses to ensure you’ll get the perfect fit – then return the one that doesn’t. 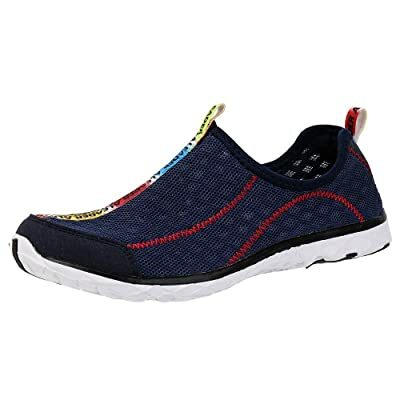 Aleader Mesh Slip-On Water Shoes for men are perfect shoes for relaxing on the lake or going for a hike along the river. They are breathable to keep your feet cool during the hot temperatures. What’s more, they are also quick-drying. You can also comfortably wear these shoes without socks. The shoes have holes on their bottom to enhance drainage. This means that the shoes won’t weigh you down when you are walking on a water-logged surface. They are made of durable and breathable mesh upper so that your foot can breathe when you wear them. Are made of Solyte midsole to make the shoes exceptionally lightweight. They have an excellent bounce back. Made of water grip outsole that facilitates exceptional traction even on slippery and wet conditions. ComforDry sockliner makes the shoes to have a cushioning performance that facilitates a drier, cooler and healthier environment for your foot. The open mesh on its upper also facilitates quick drying. Its fluid flow technology helps water to drain faster from the shoes. It’s an all-purpose amphibious shoe. It is designed to securely fit on your feet. They don’t keep out sand or pebbles. Gravel-sized rocks can get wedged into the treads on their soles. These shoes are built like typical water shoes. They have a quick-pull bungee lacing system that is designed to wrap your foot tightly. Their lacing system works well and consists of quick-action laces. If you want a secure fit, you can also tighten the laces. 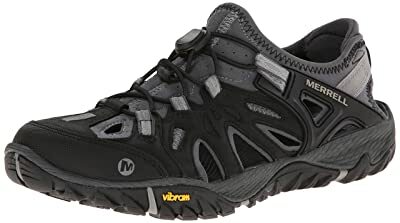 Merrel All Out Blaze Sieve Water Shoes for men also consist of thick and sturdy soles so that you won’t feel the sharp rocks under your feet as you wear them. The upper of the shoes are made of leather and are waterproof. It is easy to get them on and off. The shoes have treads on their sole that makes them grip well even on wet and slippery surfaces. They have a great lacing system. The soles are thick and stiff. You can even wear the shoes for hiking. The sole might wear out with continued use. The openings on the shoe let in rocks and sticks. Speedo Men’s Seaside Lace 4.0 Water Shoes are perfect for use in the pool, in the shower or in even at the beach. 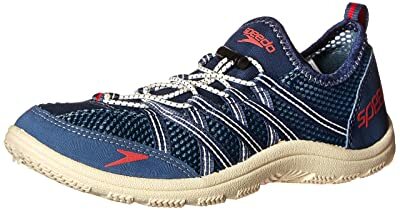 If you are looking for the best water shoes for men that don’t cost much, then Speedo Men’s Seaside Lace 4.0 Water Shoes are the right shoes for you. They are made with breathable mesh and are lightweight. They consist of rubber soles that are treaded to provide extra traction. The latching systems of these shoes are designed to tighten quickly with just one pull of the bungee strap. The shoe doesn’t soak up water. It has an effective traction that makes it perfect for use on slippery and wet grounds. It is permeable to water even when it is fully submerged. They feature a patented drainage system to quickly drain water from the shoes. This means that the shoes won’t get heavy on your feet. They have a breathable mesh upper to facilitate airflow. The soles are thin and soft. They are not, therefore, good for rough terrains. 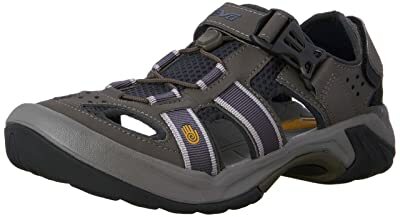 Teva Omnium Closed Toe Men’s Water Shoes are synthetic water shoes from Teva. They are designed to be used as water shoes or even hiking shoes and look like sandals. This is why they are also good for everyday use. 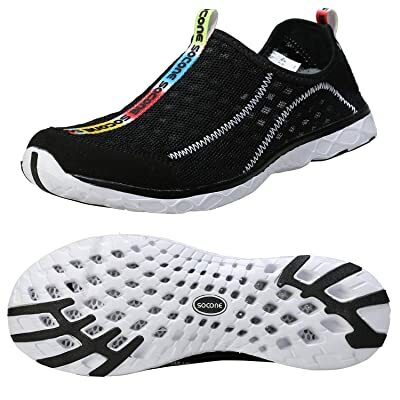 Wearing these water shoes is very comfortable since they are made of synthetic textile and rubber that are very soft. They also have cushioned Shoc-pads on their heels that help to make your feet comfortable. The shoes also feature a rubber toe bumper to shield your big toe and protect it from any sharp object that might hurt it. You can, therefore, hike with these shoes and comfortably walk in water when you have them on. Features an enclosed toebox that protects your toes. Has a pull-cord lacing system that is designed to offer the shoe stability. Features a Microban zinc-based odor-resistant treatment to take away bad odor from the shoes. Made of materials that dry quickly. It’s an all-purpose water shoe. The cushioned Shoc-pads may wear off after some time. 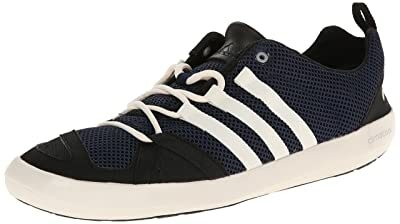 These shoes from Adidas are very smart looking. They have a quick-dry construction that makes them the perfect shoes for beach activities and fishing. You can also wear them when you want to mow your lawn. They feature a quick-drying Climacool that provides a 360-degree cooling so that your feet will stay comfortable throughout the day. The shoes also have the EVA tongue top that makes them fit snugly. The heels of the shoes have inserts that can stretch to conform to your foot’s shape. The shoes also have a non-marking rubber sole that will give you a secure grip and good traction. They are versatile shoes hence are ideal for both wet and dry conditions. The climacool open mesh facilitates breathability. Are designed to perfectly fit your feet due to their stretchable heel. They are very light hence you can easily carry them in your backpack. Its outsole can slip on surfaces that are very wet. They are not good for hiking. 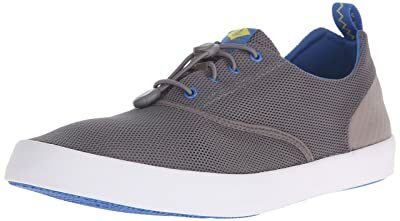 If you are looking for water shoes that will look great on your feet while still offering you an extra level of comfortability, then Speery Top-Sider Men’s Flex Deck Water Shoes are the right water shoes for you. What makes these shoes to feature in our list of the best water shoes for men is their innovative technological design. They feature a quick-drying mesh that is breathable so that your feet will stay fresh all day. They have a solid sole that is firmly attached to their upper through a vulcanized construction technique. This makes the shoes to be very reliable and durable. The shoes also have a molded EVA footbed for additional comfort. The best part is that you can remove the footbed and use orthopedic insoles if you need extra support on your foot. 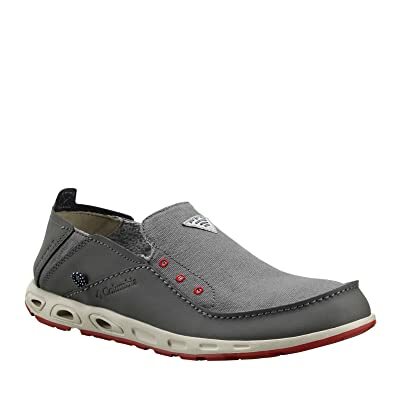 Speery Top-Sider Men’s Flex Deck Water Shoes also feature a Molded Hydro-Grip that helps to reduce any slippage. Their bungee laces also make them easy to put on and take off. The laces are also adjustable if you want a secure fit. The shoes come in five colors: Black, Grey, White, Orange, and White. The molded EVA footbed provides maximum comfort. The molded hydro-grip outsole helps to reduce slippage on all types of surfaces. Its unique outsole design facilitates stability and agility. The shoes squeak when you walk. The shoes are not ideal for you if you have flat feet. Whether you love exploring underwater worlds or you love water rafting and kayaking, your feet will be kept comfortable in these NeoSport Paddle Water Boots. They come with a zipper-less design and are made of a premium neoprene material. The shoes feature an adjustable Velcro strap that makes the shoes to be easy to wear and take off. The shoes are also perfect for use on a tough outdoor adventure due to their heavy duty soles that are puncture resistant. The upper is made of soft and comfortable neoprene material. They are designed to keep your feet warm. Their sole offers fantastic stability and high-traction. The shoes are perfect for all water activities. If you like to spend most of your spare time at the beach or swimming pool, then Columbia Men’s Bahama Slip-On Boat is the right choice for you. The shoes are lightweight and well-ventilated to add to the pleasure of wearing them. In terms of good traction, Columbia Men’s Bahama Slip-On Boat is raised up to par. This is due to its rubber outsole that is razor-siped. These shoes are also easy to wear and are incredibly versatile. You can even wear them while you are running your errands or even while driving. Ideal for all activities around the water. The shoes look classy and can be worn even on a daily basis. They offer excellent wet and dry tractions. The shoes are durable hence they can stand the test of time. They come in a large combination of colors. They are very breathable and comfortable to wear. The shoes have a limited style selection. Have you ever wondered about the ideal shoes you can buy for water activities? The CIOR Quick Dry Water Sports Aqua Shoes are a great type of shoes to engage in water sports for fun. These shoes can be used when one is going to enjoy boat related activities or when going to sail or even yoga. They come with amazing features and exhibit characteristics that make them ideal for water sports. They can be used for an array of activities that include kayaking. The shoes have the drainage holes that enable them to drain water out of them and facilitate their faster drying. With these features, it means they can be used for many water activities without wasting a lot of time in waiting for them to dry quickly. These are must-have shoes for water sports. Slip-on styles for easy removal. It can be defective at times or worn out. If you are looking forward to engaging in water sports activities, then look no further. Easy USA Women’s Aqua Wave Water Shoes are the shoes for the job. The appearance of these shoes makes them beautiful to be worn outside. 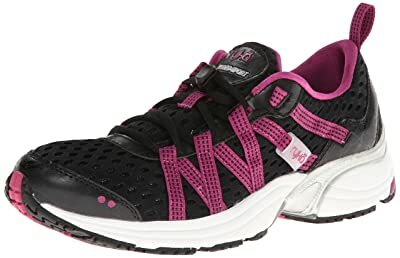 The shoes have a high level of comfortability and boast of a degree of being lightweight that would make walking, running or jogging less hard. These shoes can also be used for vacation. The shoes are made from strong materials that make it have long lasting capabilities. The fact that these shoes can be used for different activities makes them fun for trying out. The shoes being slip on, just makes having them even easier for activities such as sailing, boating, kayaking, rafting, among others. The quality of the shoes might need to be improved further. From the name; Speedo Women’s Hydro Comfort 4.0 Water Shoes have a resounding comfort in them as the name suggests. The shoes are exceptional right from their design functionality. The fact that they are made of rubber from the external surface guarantees firm grip and grasp as one maneuver around or when in water, and at the same time it guarantees durability. These shoes have draining holes that ensure faster drying. Washing them is a walk in the park because the sole inside can be detached from the shoes and be washed. What could other ideal shoes for boating or kayaking or any other water sport possibly be if not these? Stability on the ground and even on water. What more could you possibly be looking for? If you are a lover of water activities and your hobby is to play in water and splash all day long, then you might want to save up for these amazing shoes. These shoes come in various designs but they guarantee great presentation because of the appealing outlook they have. The materials used to make them are durable hence the ability to last longer. 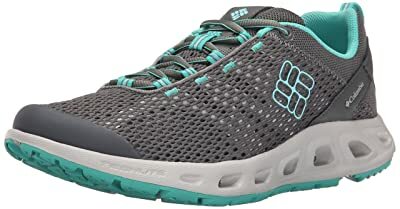 Merrell Women’s All Out Blaze Sieve Water Shoe; its peculiar name does suggest its amazing features that are super great. They also enable one to go for longer, faster as well as go further. This is why this pair of shoes is a must-have. The features in these shoes are worth the sacrifice. You would want to go on a water activity when on vacation and wondering what shoes are ideal for that. 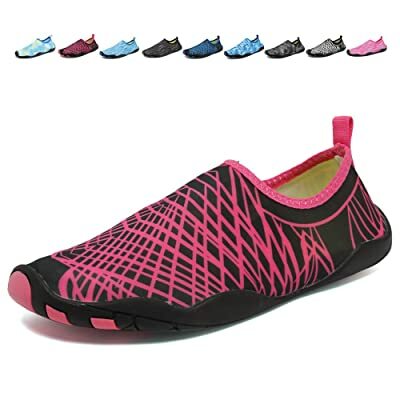 Worry no more because Zhuanglin Womens Mesh Slip-On Water Shoes are just what you may be looking for all along. These shoes not only have great quality but they perform highly as well. When you look for shoes, choose a pair that guarantees nice and comfortable fit as well as supportive ones. Its lightweight trait just makes it ideal for various water activities. The mesh allows for quick drying when in contact with water. Zhuanglin women’s shoes are also fun to walk in because of their amazing features. The mesh features situated at the bottom and sides of the shoes not only make it attractive but it offers a superior breathing aspect to the shoes for aeration and water removal. Midfoot webbing system offers the lightweight feature to guarantee breathability. Ryka Hydro Sports women’s shoes are one of the best water shoes for women. They are designed with a quick-dry upper and feature a webbing brace that offers midfoot support. The shoes answer to the water fitness needs of women. The sole is made of a flexible material and also includes a water drainage system. Its aggressive design with its adjustable lacing system offers maximum support. Features mesh covered holes in the bottom to facilitate drainage. The shoes are extremely comfortable. The sole is made of sticky rubber to provide better traction even on wet surfaces. Made of breathable mesh on the upper. Its webbing midfoot cage offers lateral and medieval support. Features a speed lace system that facilitates easy wearing and taking off. As a woman, you need a loyal companion as you go about your adventures. These shoes qualify to be one such as they feature a feminine specific style as it is designed with a woman’s foot in mind. It has a patented toe-protection that will offer your foot trusted protection. Its lacing system facilitates easy on and off comfort. What’s more, these shoes have a multidirectional lug pattern on their sole for increased traction. 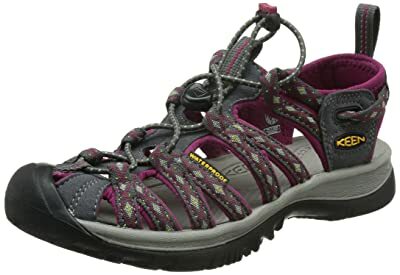 In terms of comfort, KEEN Women’s Whisper Sandals features a footbed that is universally comfortable. Its midsoles are flexible and lightweight to provide the right level of cushioning and support. The shoes dry so much faster. Has a well-designed footbed that will effectively contour to the shape of your foot. The sandal features a closed toe construction that makes it much more stable. The shoe is super simple to adjust. Is also an excellent travel shoe. It’s narrow in the toe box. If you have wide feet, you will need to order up a half size. Columbia Drainmaker iii Trail Shoes are made to handle a wide variety of outdoor activities and water sports. If your feet are going to get wet, then you would be better off wearing Columbia Drainmaker iii Trail Shoes because you can never go wrong with them. This pair of shoes features large drain ports at its forefoot and heel to drain water from the shoes. It also has a removable insole to provide your foot with cushioning. Its sides and upper are made of open mesh material to make the shoes breathable and to dry quickly. The overall design of the shoes is good since it looks like an outdoor running shoe. This makes it a versatile pair of shoes. The midsole ports facilitate water drainage and air-flow. The upper is made of mesh to make the shoes dry fast. Its outsole is lugged for maximum traction. They are super-comfortable to wear. The sole is made of rubber hence very durable. Small pebbles may filter in the shoes due to the holes. There you have it on the best water shoes for both men and women. You can, therefore, choose the best shoe brand based on your taste and your budget. 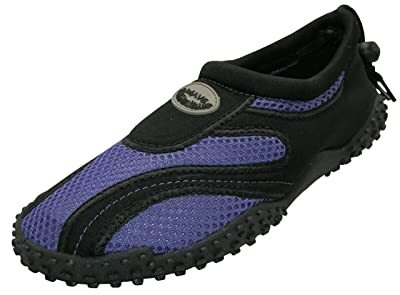 When it comes to the best water shoes for men, then we would recommend Aleader Mesh Slip-On Water Shoes. This is because they are exceptionally lightweight and have a better bounce. They are also one of the most versatile water shoes hence you can wear them when you are going out for fishing, water boating or even kayaking. 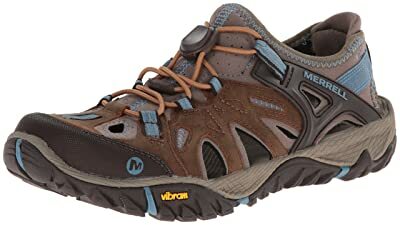 When it comes to the best water shoes for women, we would recommend Merrell Women’s All Out Blaze Sieve Water Shoe since you can wear it for all purposes. You can wear these shoes for hiking, fishing, and even kayaking. They feature a UniFly responsive Cushioning system that will enable you to walk with them for a long distance without feeling uncomfortable. We hope that we have made it easy for you to choose the best water shoes as we have narrowed down your search to the best water shoe models. Have a happy splashing! For me, personally, I like to have a show that is good in the water, as well as for hiking since most of my fishing spots require a little bit of a walk. 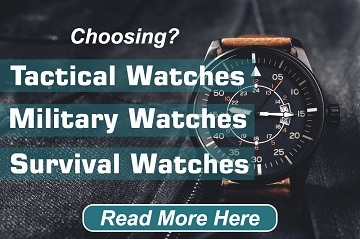 Does anyone know brand and model the ones at the beginning are ? Orange amd yellow shoe laces ? I got my eyes on that mesh walking show. I really like the fact that it will dry very quickly! When dealing with walking or running in water, I would imagine that having holes in the shoes is a bonus. It looks to me like Speedo has some real nice options here. Your blog should go viral. You need initial boost only. How to get it? I really like Viakix (www.viakix.com) water shoes. They are very light weight and dry quickly. I just returned from Hawaii and they were great. Nice collections, Water shoes especially for hiking need a lot of characteristics to note while choosing a one. I love to wear croc’s and speedo shoe types as they suit for any climatic changes as wells as the activities. Nice blog, I love it. I Think this the important new for the new comers. You have the best Water shoes product. I really like it. Thanks for sharing this helpful article. I would disagree with the choice of Keen. I have the sandal, and we kayak in a river, and I am forever having to stop and take my shoes off and rinse them out before we get back in The Kayaks and leave. Love your blog. Your sense of adventure and style inspire me everyday. My favorite water shoe protects my feet as well. 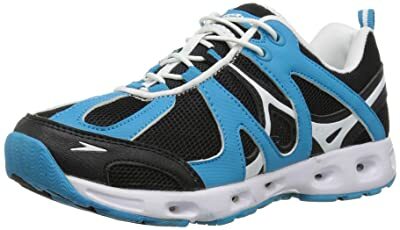 I found Newtz Open Water Shoe at the footwear. They look like a regular shoe. I just love them and honestly think you would too. Thank you so much for the great share. Keep posting like this way. I like Merrell shoe company. Because it is very comfortable and versatile than other shoes. Thanks to keeping Merrel shoe on this list. Hey, first of all, you have a really great website! In terms of the water shoes, I am getting into adventure a lot recently as I have some free time on my hands (lucky me!). I think there are a few good Speedo options which you can include. Pretty affordable and I’ve seen some good models for kayaking and surffing too. It does depend on what you want to use them. I have friends who want their shoes to be good for river walking and then climing so they need to be pretty slip resistent. I have a neurona and like to work out in a pool. I need a water shoe with a good arch.